While I was on maternity leave with toddler T, I bought this grey jersey pencil skirt. Reasoning I'd be glad I did when I returned to work months later. It's never been the perfect piece I've thought it would be when I bought it though. It's pieces like this that make me stick to my 'wear it twice in the month I buy it rule' to stop buying things I think will be perfect for later, and just buy pieces that are perfect for my life right now. With my return to work, it was an opportunity to see this pencil skirt again when I unboxed all my workwear and make the decision if it was a keeper or a mistake to buy. I wore it two different ways to really test it out. First time I wore this skirt to the office I worried at one point that the jersey fabric was too casual. Since then, I've tried to make it a little formal each time I've worn it. The style challenge for the day was 'Starts With B' so a big blue bag, a button up tank and a blazer made this jersey pencil skirt perfectly formal enough for my business casual office. I didn't worry at all about this looking too casual. Not sure if it was the collared top and blazer or the fact that I'm in a new area after returning from leave where my customers are located off-site and I no longer interact with them in person, so I can be more casual. I added the red necklace at the last moment. I'd tried on a longer blue one that morning too but I think the red necklace just makes the outfit. The red suede shoes were fun to wear too. I find bright shoes harder to wear than bright bags so these don't get worn often. They are so cute though, I keep them around. I really liked this outfit. I did have hard time getting a photo that morning without the sun in my eye, that was the only mild annoyance! Last worn: cream blazer, floral button up tank, grey pencil skirt, red suede ballet flats, Rebecca Minkoff medium MAB tote. Other ways to wear: cream blazer and printed dress, floral button up tank and maxi skirt, grey pencil skirt over a dress, red suede ballet flats and a little black dress, Rebecca Minkoff medium MAB tote and fit and flare dress. Perfect for pregnancy: cream blazer in the first trimester, skirt in third trimester, red ballet flats and hidden second trimester bump, MAB Tote and wrap dress in third trimester. The very first time I wore this skirt I attempted to wear it casually and I didn't really feel comfortable with the resulting outfit. This time around, I wore it again for a style challenge but I actually really loved the resulting outfit. It was just perfect for my day off. I spent it taking Baby Boy to a few appointments that sadly didn't go as well as I expected but at least I liked my outfit. The style challenge for the day was 'Starts With D', so I tried to dress down this skirt. By leaving the tank untucked, wearing Converse and adding the kimono, I think I made the pencil skirt perfectly casual. It was cool and comfortable for an extremely hot day too. When I unpacked this skirt at the end of my maternity leave I had planned to give it the 'one last wear' test before I got rid of it, but it's definitely staying in my wardrobe, as I felt so happy in it in both these outfits. Last worn: navy kimono, stripe tank, grey marle pencil skirt (above), Converse, Rebecca Minkoff aqua mini MAC bag. Other ways to wear: navy kimono and denim shorts, stripe tank and leopard print, grey pencil skirt and winter layers, Converse and colourful jeans, Rebecca Minkoff aqua mini MAC bag and maxi dress. Perfect for pregnancy: stripe tank in second trimester, grey pencil skirt and hidden early baby bump, Converse and maternity shorts, mini MAC in second trimester. A jersey pencil skirt is extremely comfortable, and can be dressed up or down depending on what you wear it with. Button ups and blazers are good way to make it more formal for work, and you can dress it down with untucked loose layers and Converse for the weekend or your day off. Linking up with On Trend, Trend Spin, Confident Twosday, Turning Heads, Style Sessions, What I Wore, Oh Hey Girl, Style on the Daily, Fashion Frenzy. OMG I love this!! You style a pencil skirt in two completely different ways, and it worked out perfectly! Great job!!! I prefer the office look out of the too, but I am amazed how versatile it actually is. Still I don't tend to wear many skirts when I am at home, I feel like I can't nove quite as good in them as I can in trousers. I love how you styled the skirt in both outfits! So cool that this piece is great for work and also for casual looks. Definitely a keeper. And love the red shoes and necklace too:) Great way to add colour IMO. 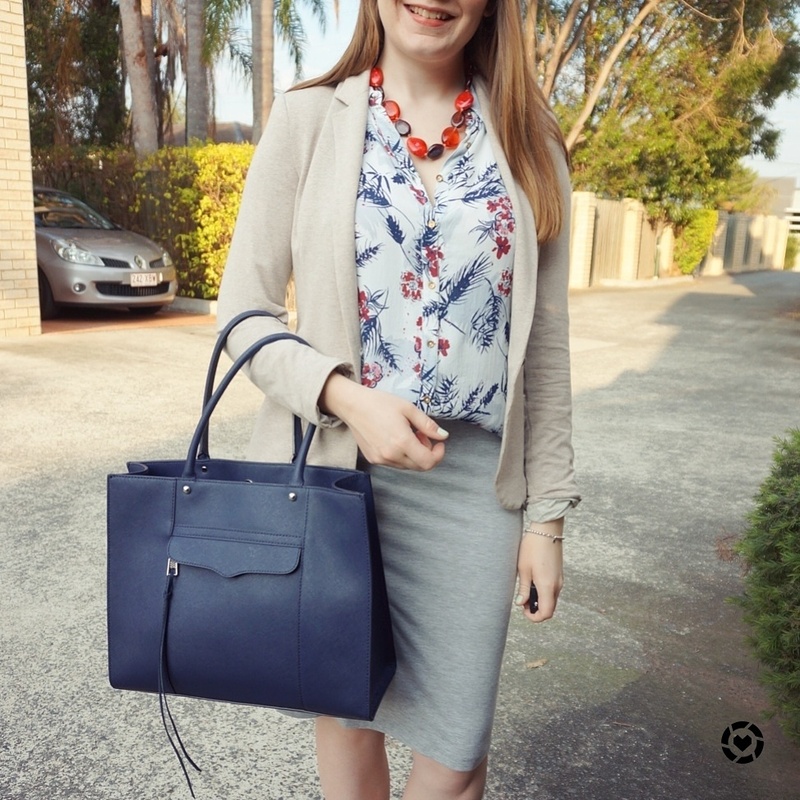 Ooh, I love the pretty red and blue print in the first blouse and how perfectly it pairs with your handbag! And what a perfect neutral skirt! Hi Mica! I love both looks! It's always wonderful when you have an item that's very versatile. You accessorized beautifully as well! I pray you have a blessed week! You look so chic! Love how you styled the blazer!! I have quite a few pencil skirts but none that are jersey! I need to get one for casual outfits! I like how you dressed it up in the first look. Definitely looks office appropriate to me. It's great styled more casually in the second look too. Love the ways you styled this skirt! That tote bag is so chic. gorgeous outfits! 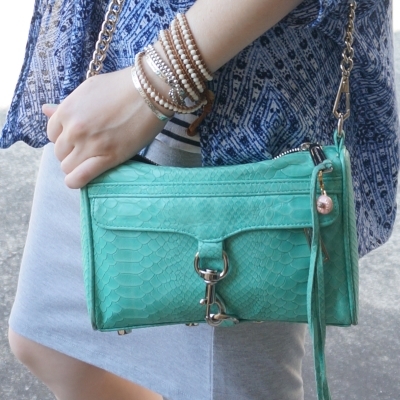 i love how the striped blouse works with that beautiful aqua handbag. so lovely! Ooh! I love the print of that first blouse! and that's definitely a great skirt! Glad you're keeping it. I think it was a great find! The material looks comfy and it looks like such a versatile piece, too; I love how you've dressed it up for work and down for a day of running errands and spending time with the little ones. Thanks for sharing and I hope you're having a great start to your week so far! This skirt is really versatile, and I loved the office look. I don't think I would have tried a more formal look with skirt, but it looked great. I like both! I love the color combinations you picked. Lovely! My fave is the option for work. I have to say it was a wise decision to keep it. I think its a great item to have by. I really like that skirt, I'm glad you're keeping it. You're proving that it can be dressed up or down--both looks really work! I'd really like to add a knit pencil skirt to my wardrobe--mine are all too dressy for my current life! Both outfits are terrific, Mica. I like how you dressed the skirt up for work (the red accents are stellar! ), and it transitions nicely into casual for the bottom outfit. Good work! Yes to keeping the skirt, you look amazing in it and it highlights your figure well! And I also love how versatile it is, you can wear it to work and for more casual occasions. I think a grey pencil skirt is such a great color and classic skirt! Love the looks and how it's styled for work and for a more casual day! Both looks are pretty! I never even considered dressing up a marled knit skirt like that. I think I will try that one day! I love the grey skirt on you! It looks really polished! Great tote too! Buying things I think will be good for some far off future is definitely one of my biggest shopping problems. But I really love this skirt on you, and I'm impressed at how easily you were able to dress it up and down. I really love the blouse you paired it with for the office as well. Yes I'm glad I have been getting more of a handle on it now with my 'wear twice in the month I buy it' rule! Oh that's a great working outfit! I'm currently still on mat leave, but I love pencil skirts! They make everything look so chic and put together! You look so well put together! As always, I love your style :) And I didn't notice the sun glare in your eyes in the photo at all! I'm glad you gave this piece another chance! I love the way you dressed it up and down. The work outfit you created is so cute! I love the red necklace and flats you added. I am so bad at wearing the pencil skirt lol but you pull it off so well! I love how you styled it! you look great and that skirt is definitely a keeper! Happy week dear! I love how this was a maternity-wear purchase that has gone on to be a fixture in your wardrobe - handy! You've definitely convinced me to give a jersey pencil skirt a go sometime; I've only ever tried jersey maxi skirts. Have a lovely week! Your outfits are always so flawless, I'm honestly in love every time I come back to your blog haha. 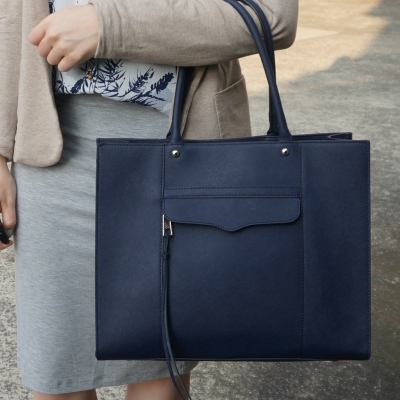 I think that having a statement colour like with the bag is always nice, and complements the whole outfit. You look amazing! You look too cute! Your outfits are always on point! I think it was an excellent purchase Mica because you can dress that skirt up or down. It's also a great neutral that you can pair with so many things. Both outfits look really nice! I'm glad you are getting a good use out of that pencil skirt, I hate having things in my closet that I never wear. I really like that skirt! I love how it looks both dressed up and down. I think I need to remember to try that with some of my clothes too, rather than having them as 'just' work clothes. Also I think only buying things for right now is very wise. I'm often tempted to buy things for just in case, and of course those are the things that are never quite right when the time comes. I am going to stop doing that! I love how versatile this skirt it! I feel like I'd love wearing it as a casual look, it's so cute and comfy! You look amazing in both outfits! Love how yoy styled the second look!! The skirt is so versatile! 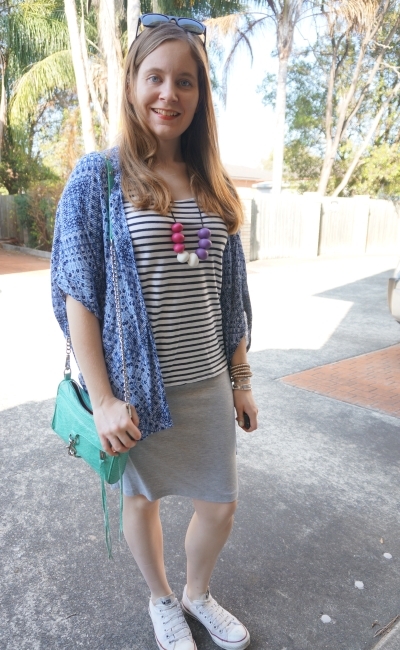 I think how you styled it was perfect for work, but I do like the casual outfit - stripes are always a win for me! Sadly I couldn't find a skirt like this in my thrifting adventures but it would have been perfect for this pregnancy. These are both great looks, but I am really loving the first one. Your floral top is so pretty and works wonderfully well with your blazer and skirt. You did a great job of making the skirt look professional. Love both ways with the jacket , as i am a fan of the blazer with structure, and the casual and fun way with your blue kimono.. of course i love both bags, especially the teal blue! I love the first one! I think this looks really chic as a smart look!